Quiet - Noise levels have been minimized to virtually below the threshold of human hearing. Low power consumption - The drive draws less than 2W while operating and a mere 4.75W during spin up. 1TB capacity holds up to 200,000 digital photos, 250,000 MP3 files, and 120 hours of HD video. These drives are designed to last in high temperature always-on streaming digital audio/video environments such as PVR, DVR, and IPTV systems. Optimized for smooth, continuous digital video playback of up to 12 simultaneous HD streams. SilkStream is compatible with the ATA streaming command set allowing CE customers to use standard streaming management and error recovery options. A cool drive is a more reliable drive. WD continues to develop new and innovative ways to keep drives cool while they operate. 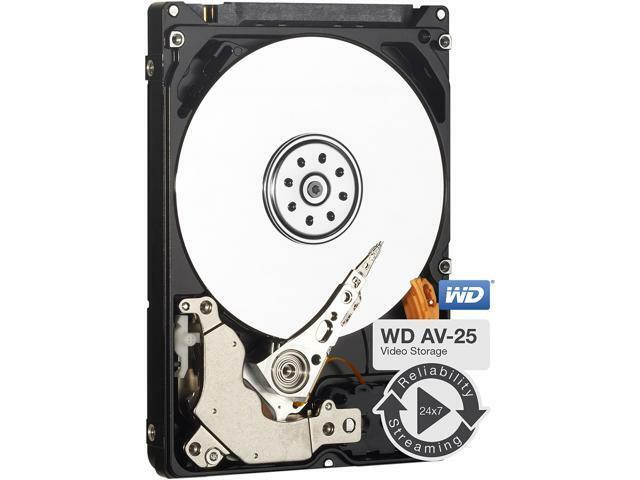 These drives draw less than 2 Watts while operating, and draw a mere 4.75 Watts during spin up. The drive arm frequently sweeps across the disk to reduce uneven wear on the drive surface, an occurance common to audio video streaming applications. Noise levels have been minimized to less than one sone* - virtually below the threshold of human hearing. I put it in my cart, and by the time I ordered, the price was up. no eggs off, my fault. Cons: Installed for 1 day and got a short DST alert, after 2 days got a SMART warning. This is for a client. Now looking at RMA it, but Newegg has a note under it saying I have to contact Western Digital. Other Thoughts: So much for making any profit on this job, and lost a customer I'm sure. Pros: Very reliable drive. Runs cool and quiet. Other Thoughts: I've been using this drive daily for a full two years in a work station (desktop) PC running Windows 7 and an Intel Core i5 CPU and it's never missed a beat. The SMART monitor reports a fairly consistent temperature of 87°F. Transfer times are fast enough for multi-GB video and other files. No problems with playback or file retrieval. Other Thoughts: Would definitely buy this hard drive again. Pros: Stable, consistent performance for the given specifications. Low noise & heat. Cons: In less than a year, my computer is very slow. Even very small tasks like opening a folder take an unusually long amount of time. Other Thoughts: I installed the unit in January 2014, and it was very nice and fast at first. Now, however, my computer is fairly slow, especially in the last few weeks. I mostly use it for school-related applications and not a lot of video or computational tasks. I will admit that I have not run all the diagnostic tests to see if something else might be slowing down my computer, but the hard drive is often a safe bet. I am going to look into getting a solid state drive so it will not slow down over time. Pros: I bought this for my new Playstation 4 when it was released in November. It has worked great for me. No problems to date.